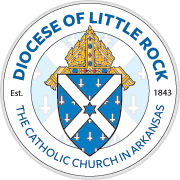 Welcome to the Diocese of Little Rock website, dolr.org. We're glad you're here, and we wanted to give you a quick tour of the top features we've built. This site also works hand-in-hand with the content you'll find on our companion Facebook, YouTube and Google+ channels. Everything from the mobile-friendly design, to the content, to the photography were put in place with your use in mind, and we're constantly adding content and making improvements. If you have any suggestions of how we can improve things, please Contact Us. To learn more, see About this Website. The large slideshow on the main page features links to timely content, such as current events and new sections on the website. These highlighted pictures work in tandem with the "What's Happening Now" articles lower on the homepage, and give you a quick glance at major things going on in the diocese and the universal Church. These homepage articles are also searchable. To find an article, click on "What's Happening Now" on the homepage and type in a subject in the "Search by Keyword" box at the top left of the articles blog page. Below the large slideshow on the homepage is the site's "Featured Content" section. This rotating tool appears only on the main page, and we use it to point you to popular or specialized content on the website, such as resources on vocations, becoming Catholic, Little Rock Scripture Study and our Getting Married Guide. It's a quick, visual way to find some of the more-interesting and helpful sections that you might not otherwise find. We've put a lot of time into improving our parish and school directories. Each parish and school listing has become like a "mini website" of its own. Parishes and schools now have their own calendar of events, list of job openings, Google map with driving directions and list of recent articles from Arkansas Catholic. We've even included a parish or school's social channels and videos. Returning features include Mass times, confession times, adoration times and staff directory. Please forgive us for trying to read your mind. You'll see "You May Also Like" call out boxes throughout the website, and our goal is to do just that. (In fact, there's one on the left of this page!) We figure that if you're reading an article about Lent, you might want to find other content about Lent, like a list of Lenten activities or information about the Stations of the Cross. It's just an educated guess, so there's no actual mind-reading happening here. Though that would be really cool if we could! If at any time you want to find a new topic, use one of the section or general search boxes throughout the site to perform a keyword search. One of the educational features on the site is Understanding Our Church, which is a library of articles about the Catholic faith. These articles, which orginally appeared in Arkansas Catholic, cover a wide variety of topics on everything from the sacraments to the liturgical seasons. They were written by Catholics in Arkansas. You may search by topic or author. Also new to the site is our Catholicism 101, which answers frequently asked questions about the Catholic faith, and What We Believe, which offers resources on all aspects of Catholic teaching.might also like Catholic Prayers, Practices and Devotions, Catholic Resources and Little Rock Scripture Study Columns. Our shepherd is busily traveling across Arkansas as he teaches us and helps guide us toward holiness. Sometimes, Bishop Taylor is able to record his homilies when he celebrates Mass. Whenever we're able, we include an audio recording of the homily alongside the written words. You can read along as you listen, or download the MP3 file to your mobile device so you can listen at the gym or in your car. In the list of homilies, look for a "headphone" icon to indicate if a homily has a companion audio recording. DOLR.org now makes it much easier for our Spanish-speaking visitors to find content in Spanish. We now offer a dual homepage in Spanish. Simply hit the "Español" button in the navigation in the blue bar at the top of every page of this website. Even the navigation is in Spanish. New content includes the Calendar of Events, homepage news briefs, directories for Spanish-speaking priests, deacons and religious, and special features such as the Catholicism 101 and Getting Married Guide. Returning features include diocesan Spanish-language programs, Mass times, confession times and parish directory. Throughout the English-language site, "En Español" links point to duplicate or expanded content in Spanish. Arkansas Catholics are busy, and we've accumulated a calendar full of spaghetti suppers, fall festivals and school Christmas programs. Now you can search and sort events by keyword, by date, by parish, by school and by month. There's also a button on each event to add it to your phone or computer's calendar. If the event has a registration form, that form is now included directly in the event listing, so you can print it out or fill it out online, without needing to visit another page. A lot of people e-mail our staff through our website. It's a quick and convenient way to find a staff member and send them a quick message. Now, if you are sending an e-mail to a diocesan staff member, you can send an attachment with your message. This is useful for event registrations or when you need to send more information than will fit in the message window. This isn't just a website ... it's a vibrant community of faithful Christians. That is evidenced by the Prayer Book of Intentions, which has become one of the most popular features on this site. Anyone (even people outside Arkansas) can submit a prayer request on this site. Bishop Taylor offers up these prayer intentions when he celebrates Mass at St. John Catholic Center in Little Rock. We also encourage all of you to remember these needs in your prayers. Together, we can lift each other up in prayer during the most frightening and joyful times in life. If you haven't already, submit a prayer request. We are here to pray for you! 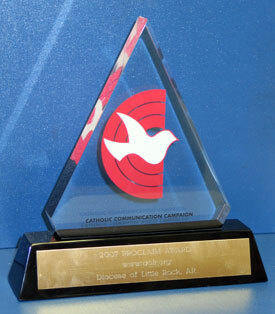 The first website for the Catholic Diocese of Little Rock was launched in September 2006. It received the 2007 Proclaim Award in the Internet category from the Catholic Communication Campaign, an office of the United States Conference of Catholic Bishops. The award was presented May 25 at the 2007 Catholic Media Convention in New York City by the Archbishop John Foley, president of the Pontifical Council for Social Communications in Rome. The proclaim awards recognized outstanding achievements in diocesan communications nationwide in the areas of television, radio, print and the Internet, all with the common goal of proclaiming the Gospel of Jesus Christ. In November 2014 a new, mobile-friendly, fully responsive website was launched with new features. It offers more than 6,000 pages about the diocesan offices, staff, parishes, schools, clergy, religious, seminarians as well as educational articles, upcoming events, prayer book, columns, Stations of the Cross and much more. To learn more, see Diocesan Website User Guide. This website received a third place award for Best Diocesan Website from the Catholic Press Association during the 2018 Catholic Media Conference hosted by the Diocese of Green Bay, Wisconsin. The Catholic Press Association covers the United States and Canada.